Danny Ainge mentioned poise and intelligence in describing Brad Stevens at the Boston Celtics' news conference on Friday. He continued to go back to his new coach's demeanor under pressure. The qualities Stevens possesses will serve him well in the NBA. On the laundry list of potential college coaches going to the NBA, Stevens was probably not at the top for those who speculate on those types of moves. But he was for Ainge. The assumption was that Michigan State's Tom Izzo, who flirted with Cleveland and Detroit, Kansas' Bill Self or maybe Louisville's Rick Pitino or Kentucky's John Calipari again, would be interested in pursuing an NBA gig before Stevens. Of course Florida's Billy Donovan had an NBA job -- Orlando -- and then gave it back within a few days to return to the Gators. Those coaches are all now the faces of their respective programs and, to some extent, their universities. There is no need for them to leave. Stevens didn't have to go, either. But his job has changed. By joining the Big East, Butler is now in the most competitive conference it has been in during its history. The expectations to win at a high level have never been stronger. Yet, through it all, Stevens remained the same. He never feared the change. He embraced it. He also continued to do things with honor and always respected the process. Ainge pulled off the stealth move by hiring Stevens without anyone outside of a tight circle knowing. Stevens was never one to discuss interest in any place but Butler. Having his wife, Tracy, as his agent/attorney limited any leaks. Ainge and his ownership group were the only sources of information on this one, and they weren't talking. Ainge said Friday that had this gotten out, there was a chance the move might not have occurred. Butler would have had an opportunity to woo Stevens back. His players may have had time to work on him. The alumni could have attempted to pressure him. That may have been the case with the administration, as well. None of that occurred. There were phone calls that happened over the week between Ainge and Stevens and one in-person meeting last Wednesday, the day the deal was agreed on and signed. I've always believed Donovan would have been the Orlando Magic head coach had he not gone back to do his news conference in Gainesville, Fla., after the one he had in Orlando. Heading back to Florida to say goodbye and to be with his family allowed the emotional pull to strengthen. The Magic had no shot to keep him when he was back in the comfort of Gainesville. Boston didn't allow Stevens to have that time to think. And he was smart to take the offer. Stevens wasn't going to take a bad NBA job or join an NBA franchise that doesn't have a rich history. He was only going to leave Butler for an elite job -- either in college or in the NBA. If the Sacramento Kings offered him a three-year deal for more money, I doubt he would have left. Even a six-year deal, with guarantees from the Kings or a similar franchise, might have been off limits. The Celtics made sense on so many levels, mostly because of the brand name and the security. The Celtics' ownership and Ainge are as invested in Stevens' success as he is in taking the leap of faith. Ainge mentioned that to deal with All-Star point guard Rajon Rondo you need to listen to him. Stevens was always a great listener at Butler. He never appeared to be dictating everything. That's not his style, and it won't work in the NBA. Stevens kept saying he's a process guy. Well, his players should react to that well, since he wants them involved in the process of building up the franchise again. Stevens wants to have a collegial atmosphere with the Celtics. Having his family around quite a lot, his two young children running around at times, will help in fostering that feeling with the team. Former Sacramento and Golden State coach Eric Musselman, now an associate head coach at Arizona State, said there are a number of differences Stevens will have to face as an NBA coach. The game preps are done in a smaller window and will come fast. The terminology is different. The personnel, the sets, the 24-second shot clock, the late-game situations, the length of the game (48 minutes versus 40 minutes), the media responsibilities, the skill level, the travel, the professionalism, the outside interests for the players and their families, the practices, the free-agency/draft decisions and trades are all unique to the NBA, said Musselman. Stevens admits to his learning curve. He said he'll make mistakes. But he'll be quick to learn from them. He has an unbelievable patience that matches his passion. Stevens' humility makes him more attractive to the NBA. He blends and offers measured comments. That should work well in this new era of the league when the tendency will lean toward a Stevens-type coach. Of course, his success will determine if he has any coattails from college to the NBA. The time was right for Stevens. He'll likely seize the opportunity as well as, if not better than, any who has tried before him. Brad Stevens is universally loved in the college coaching profession. So don't take the shock and surprise of Stevens' move to the NBA's iconic franchise in Boston as a sign of disrespect. His peers and colleagues are simply in awe by the timing, not by the move. "The best young coach I have seen in my time," said Syracuse coach Jim Boeheim. It's high praise for Stevens, who coached in consecutive national title games in 2010 and '11. "Coach Stevens is everything that is right about our profession, and was an absolute star at Butler," said Marquette's Buzz Williams, who was going to be a chief rival for Butler in the new Big East Conference but now will face a new coach in the fledgling league. "I anticipate he will be the exact same with the Celtics." Stevens had professed for a few years how comfortable he was at Butler. He was hand-picked by his former mentor, Barry Collier, to be the head coach. He could have jetted off to UCLA. He would have had Illinois. He may have been next in line to be the head coach at Indiana or Duke or Kansas or North Carolina whenever those jobs were to open. Who knows? He was that highly coveted and respected. "I am very excited for Brad, his family and the Boston Celtics," said Ohio State's Thad Matta, a former Butler coach. "He did a masterful job in his time at Butler, and as an alum I know he will be greatly missed. He has a great mind for the game and great instincts in dealing with players. I look forward to following his path to success with the Celtics." New UCLA coach Steve Alford, a native of Indiana like Stevens, has always had incredible respect for the way Stevens has handled himself and the program. "I'm very happy for Brad," Alford said. "He's done a phenomenal job at Butler and is very deserving of this opportunity. Great hire by the Celtics." To Memphis coach Josh Pastner, who is just a year younger than Stevens at 35, there was immense adoration for the path Stevens has blazed for coaches younger than 40. 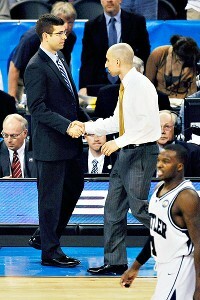 "I think Brad is one of the great coaches of the game, regardless of college or pro," Pastner said. "It's basketball. He'll do great with the Celtics. It's a great hire by Danny Ainge. A great hire. I think age is overrated. You either get the job done or you don't. You can do it or you can't. He's proven he can do the job. He has had tremendous success at Butler." But no one has been more effusive in his constant praise of Stevens than Duke's Mike Krzyzewski, the USA Olympic and national team coach. Krzyzewski was quick to compliment Stevens in the lead-up to the 2010 national title game. Coach K's Blue Devils beat the Bulldogs 61-59 -- in Indianapolis -- in one of the most epic national title games in the past 25 years. Krzyzewski said he was as surprised as everyone else by the Celtics tabbing Stevens. But he said that's because "Brad is one of the great college coaches. He's an outstanding coach. He's at a time -- he's young -- I can see him wanting to do something different. He's terrific. It's a great hire for the Celtics." Krzyzewski said he knows exactly what Stevens was going through since he had to weigh the same decision in 1990 when the late Dave Gavitt approached him about being the head coach of the Celtics. Krzyzewski said no at the time. "I almost did it with the Celtics," Krzyzewski said. "I can understand it." A source told ESPN.com on Wednesday night that the Celtics tabbed Stevens as their top choice once Doc Rivers was let out of his contract and essentially traded to the Clippers. The Celtics loved his character and knowledge of the game. His demeanor didn't hurt, either. He has always been extremely even. "He's really smart," Krzyzewski said. "His teams play that way. He's just a heckuva of a coach. He has a maturity of an established head coach right away. I just think -- forget about young coaches -- I think he's one of the best coaches. I don't think you could have a better guy. He's smart and he'll adapt. I think he'll do a really good job there." Recent college-to-NBA head coaching gigs have been doomed to fail, including Mike Dunlap, who went from being a St. John's assistant to the head coach in Charlotte, Lon Kruger going to Atlanta, Mike Montgomery to Golden State, or Leonard Hamilton to Washington. But this is the Celtics and Stevens, who has been penciled in for a Hall of Fame ticket after six seasons by his peers. Krzyzewski isn't worried about the veteran NBA players giving him instant credibility in the locker room and in the huddle. "He'll have respect," Krzyzewski said. "He's accomplished. Players respect success. He's had great success right away. So I don't think he'll have any problem with the players respecting him. They'll respect him. They respect excellence. He has it. It's a terrific hire. I'm a friend of his and I wish him the very best and I'll be pulling for him. To take over one of the most storied franchises in sports in an incredible opportunity, I can understand him doing it." AMHERST, Mass. -- Brad Stevens gathered Butler in the postgame locker room and made it clear that these Bulldogs had finally found their identity. They were a Butler team now. The Bulldogs had provided college basketball with three of the best finishes this season: beating Marquette on a wild running 3-point shot by Rotnei Clarke in Maui; an Alex Barlow shot in the lane to knock off then-undefeated Indiana in Indianapolis; an epic driving midrange floater by Roosevelt Jones to beat Gonzaga at Hinkle. But all of those highlights meant nothing when Butler was getting blitzed by VCU last Saturday, exposed during the Rams' havoc as a team that looked like it couldn't handle the pressure -- on the court or off -- of being an elite team this season. Suddenly, Butler appeared to be pedestrian, losing at home to Saint Louis by four and at VCU by 32. If Butler was to be taken seriously in the NCAA tournament, or even next week in Brooklyn at the A-10 tourney, then it had to show it against a pesky UMass on Thursday and certainly in a home finale against Xavier on Saturday. On Thursday, at least, the Bulldogs did. UMass can disturb a team with its frenetic pace. But the Minutemen, who had visions of being a bubble team after winning at Xavier, don't take care of the basketball well enough. There was a stretch when Butler turned it over due to the pesky nature of UMass point guard Chaz Williams (four steals), but the Bulldogs didn't wilt and ultimately had more steals (8-7) than UMass and won 73-62. Under Stevens, Butler hadn't been beaten down before like it was against VCU. This was a true test for the Bulldogs. Stevens said he couldn't take Sunday off and let that result linger, so Butler practiced the day after losing to the Rams, took Monday off and locked in the UMass game with the hope that the real Bulldogs would emerge in that game. The players also had a team meeting, not to complain or whine but to discuss roles. Center Andrew Smith said during the team meeting, the players went around the room and made sure everyone knew what they were supposed to do. "We got hit pretty hard and had to make some changes,'' Smith said. The Bulldogs have a quality shooter in Clarke (17 points against UMass despite going 3-of-12 on 3s). Smith brings production in the post (15 boards and 13 points against UMass). Roosevelt Jones (eight assists Thursday), Barlow (four steals) and Kellen Dunham provide a combination of energy, rebounds, assists, steals and can be other scoring options. Khyle Marshall has always been a potential X factor as a small forward and was efficient Thursday (14 points). But sophomore Kameron Woods, who scored a career-high 17 points in 19 minutes off the bench, was an unexpected offensive threat, which may be a good omen. He made athletic plays, including two consecutive alley-oop dunks, and buried shots with range while making it difficult for the Minutemen to defend the power forward spot. If an opposing defense focuses on Clarke, Dunham (1 of 7) or even Jones, then Woods has the ability to answer. Woods played his best Thursday night, despite slamming the back of his head on the floor at one point. "It hurt really bad,'' Woods said. "What I did was think about what I could do to help this team: hustle and rebound and score." Smith said Woods hitting his head and then coming back five minutes later and playing hard motivated the team. The Bulldogs played Saint Louis twice in the A-10 and went to VCU, La Salle and UMass without a return. They also opened up against Xavier in a nonconference game that was scheduled before Butler left the Horizon League to join the A-10. Stevens said that essentially gave the Bulldogs a hard (if not the hardest) A-10 schedule. This may be the Bulldogs' only season in the A-10 if the new Big East, led by the departing Catholic 7, comes calling as expected in the next few weeks for fall 2013. If so, then Butler earned its name in the conference in the Bulldogs' only year in the league. But Butler has never been just about league wins or conference titles. Playing in consecutive national championship games puts the focus on a higher goal. That's why Butler still needing a win over Xavier on Saturday to earn a bye in the A-10 tournament next week didn't register with Stevens. He said he didn't care about the bye and was completely indifferent. All he wanted to do was play good basketball. The Bulldogs did that Thursday night after the VCU loss naturally created questions. Stevens now has a "true" Butler team again, which means only one thing: It could be one of the toughest outs in the NCAA tournament. Every team in the A-10 needs to thank the Horizon League and the Colonial Athletic Association for their stringent rules preventing Butler and VCU from playing in the conference tournament. That was the reason the Bulldogs and Rams bolted a year early to the A-10 once the leagues said a pending departure meant they couldn't represent the league in the conference tournament or play for the automatic berth per the bylaws. Take those two teams out of the A-10 this season, and suddenly the league is suspect and loses the high-profile matchups that have occurred this past week and resulted in court storming. Richard Mackson/US Presswire Brad Stevens and Shaka Smart have brought a new legitimacy to the A-10. La Salle's win over Butler helped validate the Explorers. Take Butler out of the league and suddenly La Salle doesn't have the same opportunity. Xavier is not ranked, and while the Musketeers are doing their normal thing in the A-10 and hovering atop the standings, beating X doesn't mean as much this season. The same is true of Temple. "The win for us is a great one because we beat a top-50 team, and top-20 wins are key to getting in the NCAA tournament,'' said La Salle coach John Giannini. "It's also a great perception win for your recruits and alums because [Butler is] a recognized national program. The same applies for VCU. Richmond and VCU were once in the CAA together in the late '90s. Having the two programs in the same league again for the first time since 2001 means they will play twice a season. The game created interest in the local media and will be a key rivalry going forward in the A-10. They are also guaranteed sellouts for both VCU and Richmond. La Salle's win over Butler produced a court storming. Would La Salle storm on any other A-10 school, outside of VCU, now? The A-10 has had a number of teams take turns at the top, with the two most consistent programs being Xavier and Temple. Temple will be gone to the Big East next season. When the A-10 secured Butler and VCU as members and then actually got them a year earlier, it turned out to be the biggest coup in all of the realignment moves. Clearly, there have been moves made for financial and football reasons that have helped and will help some of the top conferences. But the Butler and VCU moves, while not done for money, have improved the competitive balance, national recognition and profile of the A-10 more than any other expansion moves in recent memory. And that's why it will be imperative for the A-10 to do whatever it can to keep them from being poached by the departing Big East Catholic seven schools. If those schools take Xavier and/or Dayton, then it will be a hit for the league. Losing Butler, though, would be devastating. The Butler brand resonates with this class of students more than any other school in the A-10 because they remember the consecutive title-game appearances. Butler will likely be courted and will probably go if the offer is too good. The schools departing the Big East will likely go only with private schools, not just religiously based, which means VCU is out. But it's still a fluid situation. No one would have noticed if La Salle was atop the standings and had beaten Xavier or Temple. But knocking off Butler and the subsequent court storm gets the league and its programs the national recognition they so desperately need.